St. John’s Bible Study and Sewing Seeds of Faith Women. A Wonderful Visit from St. John’s Bible Study in Mansfield! Recently, the Women’s Bible Study group from St. John LC, Mansfield, joined DOW’s Sewing Seeds of Faith (SSOF) Program for a morning of fellowship, sewing, and food and prayers. 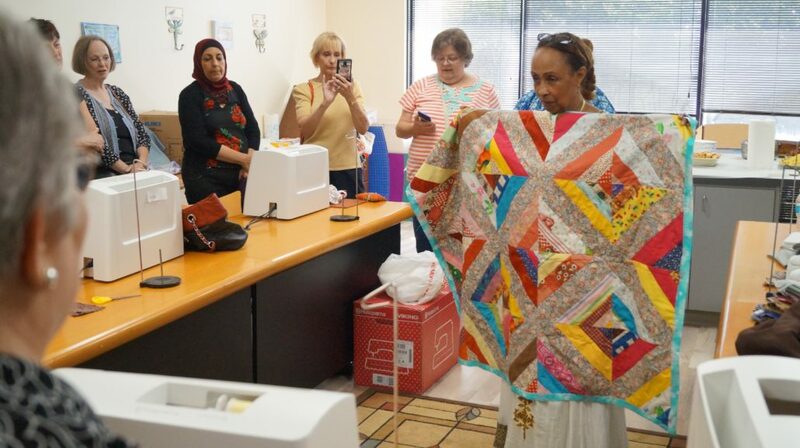 Immediately after a short tour of the new Refugee Sewing Center, Women of the Way students could not wait to show their new American friends from St John their colorful quilts, jackets, and bags. 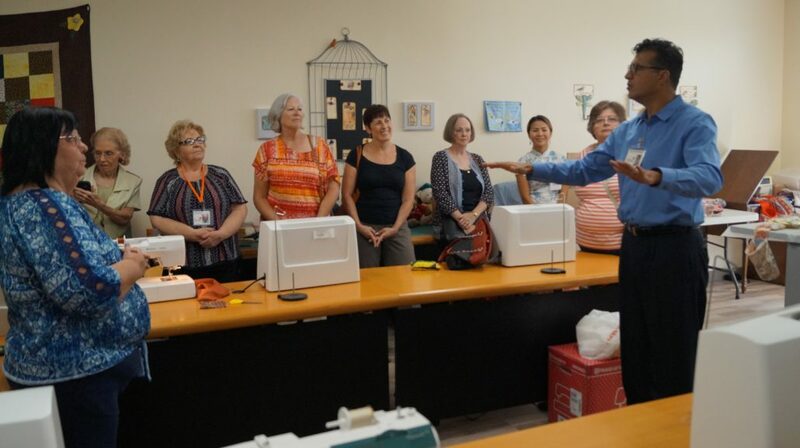 They were very encouraged to make new friends and show their current sewing projects and talked a little bit about themselves, their experiences and background. Zyian showing off her quilting project. Pastor Baidaoui spoke about how God in Rev 7:9-11 gathered people from all nations, from all tribes and languages. God sent His beloved son, Jesus the Lamb, to exchange his white robe of righteousness for their dirty clothes and sinful garments and made the world’d cleanest and most colorful quilt on earth. God the Holy Spirit calls us to come out of the church with joy and gladness into the mission field to show and tell our neighbors about Jesus His beloved Son. Pastor Karim giving a devotion on Revelations 7:9-11 about how Jesus has made a colorful quilt of believers from all nations. One special and unique feature of our sewing program is the potluck lunches and devotion time shared between the sewing students and the volunteer instructors. 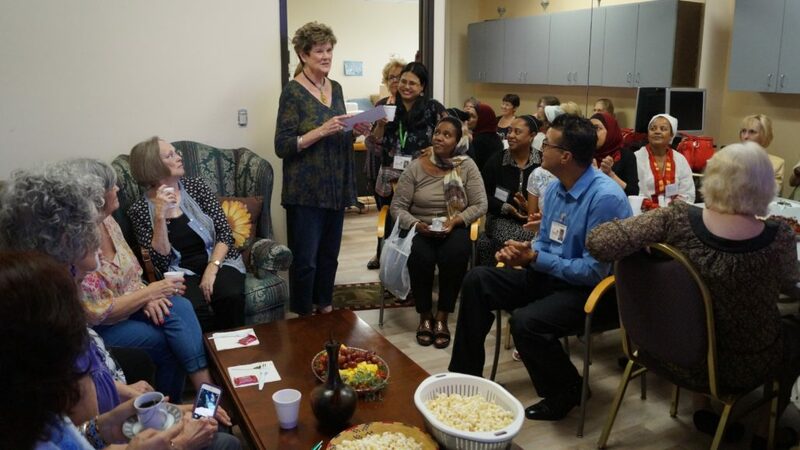 The SSOF women welcomed their new friends from St. John’s with a traditional Ethiopian Coffee Ceremony with some of their finest Ethiopian coffee and they were so excited to share a potluck of ethnic dishes for lunch. The Coffee experience really beats “Starbuck’s”. Following a wonderful and delicious lunch, women from Mansfield, Dallas, Iraq, Ethiopia, and Eritrea joined together in prayer celebrating the name of Jesus Christ. Disciples of the Way would like to thank the St. John’s Bible Study group for their continuing prayers and their generous donation which will be put toward the purchase of a sewing machine and other sewing supplies as needed. 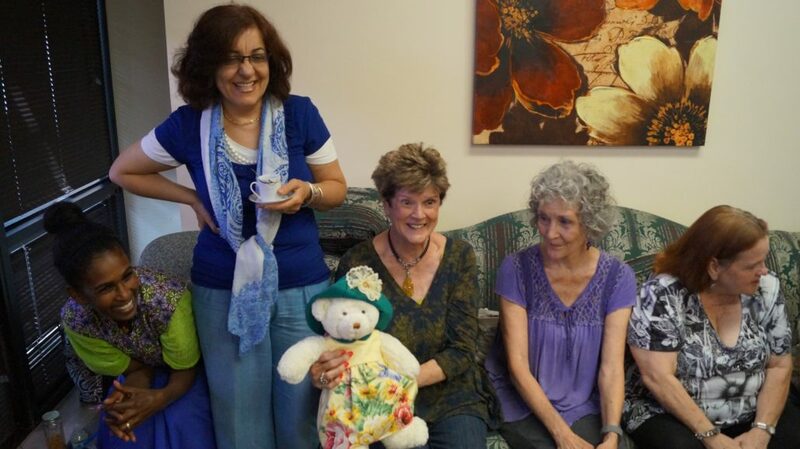 The SSOF women were all happy to hear that Angel, the white bear in the photo below, has found a home in St. John’s library so that she can be enjoyed by all. Angel is one of the bears from Disciples of the Way’s recent Hug-a-Bear gratitude project. Her dress and hat were made by SSOF sewers. Women from all nations enjoying fellowship with one another and prayer. Disciples of the Way is very grateful to St. John’s Bible Study for their generous donation toward sewing supplies. Sewing Seeds of Faith New Classes Thanksgiving Baptisms at Grace Korean Lutheran Church!